Childhood for us was about butterflies, birds, paper boats, crayons, flowers, endless afternoons, a world fresh and awaiting discovery, and grandparents. It was also about stories, hundreds of them. Stories about kings and queens, brave men and women, the good and the bad. Stories so real that they erased that false line "separating" fact from fiction, reality from fantasy. Unfettered from adult traps and fears we were free to imagine. Creativity took wing. We soared. There were also books that we read or were read to us. I remember my mother coming home from exhibitions of books from the Peoples Publishing House. So our growing up was also a fascinating engagment with folk tales from the Soviet Union. And of course Sybil Wettasinghes stories. We loved her stories and the illustrations which made the characters and their adventures come alive. We learnt that all things in this world are precious, that animals were characters with thoughts and dreams no different from ours, and that there was no such thing as an "inanimate" object. Sybil was born in 1928 in Ginthota, Galle, her fathers ancestral village. Her father was a building contractor and her mother, who was from Weligama, had been a very artistic person, especially with the needle, being good at lace-making. Sybil was the second in a family of five. She had spent her early childhood in the village, attending the Ginthota Buddhist School (the forerunner to the Ginthota Madya Maha Vidyalaya). "When I was a child, the world around me seemed a more fresh, nicer and a more beautiful place. This is why my childhood, in my rustic village home, seems to me, a long, beautiful dream. Then people semed to live as warmhearted human beings giving out love and affection, caring for one another with a kindred togetherness. Enchanting recollections from those days keep pouring out of my heart, mingled with love towards all those lovable country folk. It is an experience too precious to be kept within me." I have heard it being said that in each of us there is a child that lives and a child that died. Right at the beginning of our conversation Sybil demonstrated the living child in her, her eyes lighting up as she exclaimed, "my childhood....it was wonderful. The whole day was mine!" How different, I thought, from the crass advertisement promoting the acquisitive urge that destroys community and solidarity, shouting "the whole world is mine!" From that moment on it was not difficult for me to understand how she came to write so many childrens stories and moreover to touch children of so many generations and so many cultures. There is probably something universally common among children and only a child or someone who has protected the innocence and unbounded love of childhood can touch children in this manner. As is often the case, Sybils grandparents were an important part of her childhood. "My grandmother was my friend. She took me for walks, took me to bathe in the river. With her I discovered birds, learned to distinguish them by their calls. She was illiterate, but she was like a book, full of stories and folk poetry." It is therefore not surprising that Sybils illustrations have a familiar rural touch, for in a sense she is not doing anything new but giving release to the uncontainable creativity of the child in her. And yet, she had to travel many paths, some unfamiliar, where she had to learn new things, before she became a household name in this country. 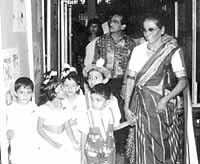 "My mother brought me to Colombo when I was six. I was sent to Holy Family Convent, Bambalapitiya. I did not speak English at that time. I was asked not to speak one word of Sinhala. Since I couldnt speak, I learnt to read and developed a love for literature. The nuns were from various countries and I was fascinated by their stories. "From the time I was very small, I was interested in drawing and I began by doodling on the sand. My mother, however, didnt want me to draw. Most of the nuns also considered that drawing was not important. I was made to understand that it wouldnt take me anywhere. Studies came first, and drawing was not considered a part of it. I used to write too, and would send poetry to newspapers under fictitious names." During the war years, the family had gone to Weligama. Apparently her mother didnt want to go to Ginthota because she thought Sybils father would never come back to Dehiwala, where they were residing. According to Sybil, this was a "mistake" on her mothers part. "My mothers brother had been to Nalanda. He had a library. No one read English. I struggled through, using a dictionary and my English improved a lot." Strangely, Dracula had been her favourite character. She had also devoured Agatha Christie and Sherlock Holmes. Many years later, she had had the opportunity to go to Whitbey, a small village in Yorkshire, where she had noticed a poster in a coffee shop inviting people to "join the ghost walk". She had told her daughter that she wanted to take part. And it had been "Dracula" who had led that walk! Ghosts and the darkness, she confessed, had troubled her for a long time. She recounted several incidents where she had spent sleepless nights, alone in strange places, chanting the thun suthraya ! Naturally, she was more interested in books with illustrations and acknowledges that the styles of illustrating influenced her a lot. Hans Christian Anderson, the Brothers Grimm and later the Jathaka stories when she got interested in history had influenced her considerable work in the genre of childrens stories. Although Sybils mother had set her sights on her daughter going to university, her father had been more sympethetic to her creative urges. "He sent some of my drawings to an exhibition at the Art Gallery. H.D. Sugathapala, the Head Master of Royal Primary, had seen it and came looking for me because he wanted me to illustrate his Nava Maga Standard 5 Reader. My mother said, I dont want her to get back to scribbling. I was very sad, since I wanted to spend all my time drawing pictures." According to Sybil, Sugathapala and his wife would have realised this, for one day they had taken her "to see how a paper is produced". This was in 1946. "I was fascinated, and on the way home I pleaded with them to get me into a newspaper." Her mother, not surprisingly, had disagreed. Sybil had lost interest in her studies. Mother Annunciation of Holy Family Convent had recognised her talent but had disapproved of her fascination with the subject of drawing. Eileen Dissanayake, her English teacher, however, had been very encouraging and had once said, "Sybil, dont feel sad. Your line is not mathematics or geography. You will someday do very well with art and literature." "My grandfather was a sculptor. When I was about 12, I remember watching him sculpting a naked woman. I sketched the figure and showed it to him. He thought it was wonderful and told me to show it to my teacher. My art teacher, Marie Therese smiled and showed it to Mother Annunciation, who confiscated it and forbade me to draw. That evening as I came home, my grandfather was waiting for me. What did your art teacher tell you, he asked. I burst out crying. "But I was rebellious and told myself that I will succeed somehow. Once Ms. Eileen got me to illustrate the poem "Lochinvar". Mother Annunciation saw the illustrations pinned on the walls and wanted to know who was responsible. Ms. Eileen said I got Sybil to draw it to help the children understand the poem better. Although Mother Annunciation was opposed to me drawing, she did get me to draw christmas cards." Sybil had left school after sitting for her SSC, and even today does not know if she had passed. Her mother had relented and allowed her to illustrate Sugathapalas book. Martin Wickramasinghe, apparently, had reviewed the book and had said that Sybil had a good future as as book illustrator. Her mother had been a great admirer of Martin Wickramasinghe, so things had changed a little and at 17, Sybil got permission to work for the Lankadeepa. "D.B. Dhanapala had a chat with me and asked me to illustrate some folk poems every Saturday. All my spare time was spent in the book shop. I would see a beautiful woman who often breezed in. I found out that she was Sita Jayewardena, who did the womens page in The Times. The next day, I got into the lift with her and followed her into her office. She asked me who I was and I told her, I am Sybil de Silva, I do only a strip and want to do more. Victor Lewis, the editor of The Times got me a drawing board and with Dhanapalas permission I started working for The Times as well. I used to illustrate Sooty Bandas articles, short stories." In 1962, the evening tabloid, Janatha, was started with Denzil Peiris as the editor. Mrs. Edmund Rodrigo, a sponsor of the arts had seen my work and said she can get Sybil a job at Lake House. That was a time when everyone was rushing to Lake House as though it was a gold mine. "Collette, G.S. Fernando, Wijesoma and others went and I followed. Mr. Dhanapala was upset but he said it is for your betterment and let me go. At Lake House, Sybil had got to illustrate an entire page. "There was a tall fair man who would often look over my shoulder at my work. He was the chief sub editor. The lady who wrote, once fell ill, and he told me, I want you to write something and give it to me in two hours. So I wrote a story. The next day, Denzil came and congratulated me and said, now I want you to write a story everyday! My first story was kuda hora (Umbrella Thief). It has now been published in 13 countries. Denzil got me to write to the Observer too." "I always had the urge to write in Sinhala. I read a lot of Sinhala books. I used colloquial language and found that this works best with children." Her success speaks best about the wisdom of the choices she has made in this particularly fascinating branch of literature which has only recently won anything by way of recognition among the know-alls about these things. Today in Sri Lanka we see a veritable mushrooming of childrens literature, they are unfortunately more profit oriented than anything else. Sybils illustrative signature is evident in almost all the glossy booklets that pass off as childrens literature in the bookshops. That, I believe, is the mark that literary unfolding pins on pioneers. Sybil has certainly not had a fairytale life. The "tall, fair man" had eventually proposed to Sybil. Don Dharmapala Wettasinghe and Sybil married and they had four children. The seventies had been a rough time for the family. Sybils husband had lost his job and Sybil couldnt get herself to go to Lake House. "I dont know how we managed through the seventies," she said. My husband suggested that I take up Batik. Soma Udabage, a friend, taught me the technique. We put up a shed, got some girls to do the waxing and started work. A friend gave us a shop in Bambalapitiya. In time we got a lot of export orders from Italy, the USA, UK etc. Once Sri Lankas ambassador to Japan had worn one of my batik shirts to a function and we got an order for 500 shirts. I experimented with colour, did murals which I would hang on the window. Later I found that they were copied by others who used them to print their own fabrics." Her main urge, however, remained drawing illustrations. In the early eighties, the owner of the house they rented had died and his brother had wanted them to leave. So they had applied for a loan from the State Morgage and Investment Bank and started building a house. Around this time, Sybil had submitted a new set of illustrations of kuda hora to a competition organised by Noma Concoures Picture Book Illustrations. She was placed third. publishing the book. In 1986 they wrote and told me that my book had won the Best Foreign Book Award. No one ever took notice, although it is rare for someone to be honoured this way. It was only five years later that Anula de Silva, who happened to notice the plaque in my house, wrote a piece about it. "In the same year, the children of Japan had voted Umbrella Thief as the best childrens book and 1986 was in fact labelled as The Year of the Umbrella Thief. The Japanese publisher took the book to the international book fair held in Bologna once every two years. That is how my books went all over the world and children from different countries are able to read them in their own languages." For the record, Umbrella Thief is now in its 20th print. "Once a team from the Kijo Picture Book Village came to visit me. They wanted to see my originals and suggested that I sell them. I told them that I had never thought of selling them. They said, it is selfish to keep them in this house. I consulted my children and they agreed that is better to make them available to the whole world, so now they are in the Kijo Village. "No one wanted to see them all these years, and now people want me to exhibit," she said. Yes, Sybil Wettasinghe has won more accolades outside the country than from among her own people, even thought she has been a quiet, unassuming ambassador of the most gentle kind, for once you commune with children, you make connections for the future. Her book Wesak Lantern, was recognised by the Womens Coucil in England as the best childrens book from Asia. This was in 1965. It was finally published in 1996. It won the State Literary Award for the best English Childrens Book in Sri Lanka the same year, although some in the panel of judges had objected, saying that her books are mostly illustrations. Children, these people might have forgotten, read images more quickly than words. And if books are meant to provoke imagination and creativity, what is important is not the "size" of the illustrations in relation to the text, but the final product, assessable only in terms of how it inspires the target audience. Maybe children should judge childrens books. This is how Sybil dedicated the book The Child in Me. "The love and peace cultivated in my heart as a child, has remained throughout my whole life. With this love I warm-heartedly present, The Child in Me, to everyone, young and old." She told me that when she does stories, she lives in them, becoming the characters she creates. "And when I am done, I am sad. For example, Hoity the Fox went out of my life when I finished the story". All those characters, she should be happy, came into the lives of thousands of children. Thats an embrace that anyone should be proud of. After interviewing Sybil, I called my wife and told her, "parana yaluvek hamba una". When I told her it was Sybil, she was thrilled. Mind you, neither of us had ever met her before. Our childhood consists of what are called formative years and I am sure hundreds of thousands of people who are now adults owe a lot to Sybil. Yes, in many ways we have failed, otherwise our country would not be in the mess it is in now. We cant blame Sybil. She has done her best. Maybe we dont read enough childrens stories. Maybe we forget the child in us too easily. Worse, we probably go out of our way to kill that innocent, curious and hopeful being. Perhaps we can draw hope from the fact that if there is one creature that is "ressurectible", it is the child within each of us. A return to the work of Sybil Wettasinghe can do no harm, I think. Those were formative years and I am sure hundreds of thousands of people who are now adults owe a lot to Sybil. Yes, in many ways we have failed, otherwise our country would not be in the mess it is in now. We cant blame Sybil. She has done her best.